It was a balmy June evening, and I had an itch to get out. 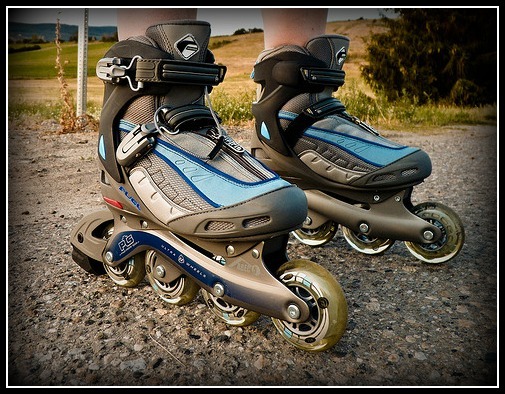 After strapping on my rollerblades, the ones that always reminded me of downhill ski boots, I waddled gracefully across the front lawn, through the gravel by the mailbox, and down the neighborhood road to the bike path on Lakeshore Drive. I turned south, and inhaled the moist summer air. Lake Michigan was less than half a mile to my right, shielded by driveways lined with overprotective trees that ended in lakefront private property. Finding my stride, I glided in rhythmic motion left, right, left, right, soaking in the rush of the exercise and the breeze against my face. Gaining ground, I approached the property where a friend of mine was employed as a landscape manager and general property overseer. Wondering if he was still working, as was his custom, I glanced down the long, gravel driveway and saw a vehicle tucked in behind some trees. I’ll look again on my way back home, I thought to myself. I kept on, lost in my own thoughts and probably humming aloud to myself. After another mile or two, I decided my legs had probably passed the halfway point in their tolerance level, so I decided to turn back. Getting closer to the same driveway I had peered down on the first leg, I craned my neck to have another look. Nearing dusk, I reasoned that my friend was probably wrapping up his last tasks of the day, ready to call it quits until morning. Maybe I would catch him leaving, and could say a quick hello. Not able to see well because of the lengthening shadows of the trees, limited sunlight and already dense landscape, I leaned my shoulders forward, stretching my gaze to the left as far as it would pull, still skating steadily. In a blink, I was sent sprawling across the tarmac, skidding on my left hip bone before coming to a stop flat on my stomach. I had no idea what hit me, but whatever it was, it hurt. I lay there for a while, unsure whether I should laugh or cry. Surprisingly, my knees, elbows and the palms of my hands remained completely unscathed. Glancing around for potential spectators and finding none, I gingerly lifted my shirt to assess the damage. General red lines of grazing traveled lengthwise up my abdomen, but the worst was the left protrusion of my pelvic bone. A navy blue egg had already grown and pushed against my waistband. Turned out I couldn’t button my jeans for a week, for the swollen bruise I had pocketed as a souvenir. Thankfully, I could laugh at the ridiculousness of it then, and still laugh about it now. It was my own fault, straining to see down a driveway when I should’ve been looking straight ahead. A decade and a half later, I can look back and see a spiritual lesson in my foolishness. By failing to let my eyes look straight ahead, by not fixing my gaze directly before me, I paid the consequences — in a very sore way. Sometimes the Lord disciplines those He loves (Hebrews 12), and often, it’s painful. And while it may be sore temporarily, His discipline almost always serves to gently shift our gaze back to the narrow path, that we might ‘fix our eyes on Jesus, the author and perfecter of our faith’ (Hebrews 12:2). How have you experienced the shifting of your gaze to other paths? How has the Lord brought you back? To read more Memoir Monday posts, including that time I almost died or the time I had my wisdom teeth removed, click here. This was spectacular. I just love what you’re doing with memoirs… just a little snapshot into a moment of your life. Awesome!! !